Late into the afternoon of Thursday, March 29, 1945, the warm, languid breezes blowing off the Tidal Basin carried with them the only promise that Washington, D.C., ever entirely keeps: a summer of voracious humidity. But spring still had a few weeks left; this afternoon’s haze was slight. As the setting sun applied its amber brushstrokes to the limestone of the Bureau of Engraving and Printing, a motorcade turned off 14th Street and made a left onto D, slipping behind the Bureau’s new Annex building. There it disappeared into a rusty fan of railroad tracks that branched from the main line as it curved eastward off the Potomac bridge. The cars’ destination was a spur track and platform, used mostly for the offloading of ink barrels and bolts of the cotton-linen weave that, once they had been spooled into the presses upstairs, would slip away as sheets of United States currency. The loading platform possessed a second purpose, however, a top secret one1—one that became apparent as the limousines’ engines settled down to an even purr beneath their long hoods and the Secret Service men stepped from the running boards, their hard-soled shoes and the sounds of slamming doors echoing down the concrete platform. Drawn up alongside the idling cluster of automobiles was a train, but this was no string of freight cars. Six coffee-green Pullmans, glistening from a recent bath in the yards, lined up in the shadows. Through the windows, uniformed men could be seen moving up and down the aisles. The preparation for this trip had been under way for several hours. Franklin Delano Roosevelt was leaving town. There were times, not long ago, when yardmen had orders to assemble an entire decoy train and send it up the line, all in an effort to confuse and foil saboteurs.8 The fears that led to maneuvering like this were not altogether absurd. It was wartime, and the memory of the December 7, 1941, surprise attack at Pearl Harbor still festered. There had been talk of spies in Washington, some even operating inside the White House itself. Allowing the presidential train to depart from nearby Union Station, one of the busiest railroad terminals in America, was to leave the commander in chief open to plain view. On this afternoon, the United States had been at war for 1,208 days. For that entire time, it had also been under the leadership of one man, the one whose six foot, three-inch frame Mike Reilly now lifted through the rear door of the presidential limousine (the president’s favorite—a four-ton, blue Packard convertible9) and into a wooden wheelchair. With Reilly pushing, the rubberized wheels trundled toward a private Pullman car at the rear of the train. The car’s name was Ferdinand Magellan. Franklin Roosevelt had just turned sixty-three. An attack of poliomyelitis had left him paralyzed from the waist down for twenty-four of those years. Polio was part of the reason why Mike Reilly had chosen this secret train platform for the chief executive’s departures—FDR’s paralysis had been largely concealed from public view with the cooperation of a gentlemanly press corps. But polio was not responsible for the president’s pallid skin and sagging shoulders as he rose to the Magellan’s open vestibule via a hydraulic lift anchored to the car’s underframe. Nor was it—clinically, at least—the grueling “Big Three” meeting with Churchill and Stalin at Yalta, a round trip of 14,000 miles, from which Roosevelt recently returned looking haggard, frail, and bloodless. With the exception of Dr. Bruenn and Anna Roosevelt, none of the presidential entourage assembled on the platform beneath the Bureau of Engraving and Printing on this fading afternoon knew about the president’s specific condition. What they did know was what they could see, and that was that their chief needed a rest, desperately. Those who later would write about this trip would recall a shared feeling of hope—albeit a taut, nervous hope—that it would return the old FDR to them, the one whose jaunty manner and sparkling smile had recently disappeared beneath a drawn face and hands that shook so badly he could hardly get a lit match to the tip of his cigarette. The chief’s all-too-apparent exhaustion was why, in a few more minutes, once the cooks had finished stocking the dining car’s pantries and the conductor had given his pocket watch a final glimpse before stepping aboard, this train would be heading south. Integral to the small miracle of coordination and secrecy required to prepare the presidential train, even for a short trip like this one, were code words. “U.S. 1” was the name that the Secret Service preferred over Ferdinand Magellan, whose name didn’t appear anywhere on the car’s 5/8-inch-thick steel skin. There was “The Informer,” the name coined for FDR’s Scottie dog, Fala, who accompanied the chief everywhere he went and could be counted on to blow his cover.15 Finally, there was the code word for the train itself: POTUS. The clunky and undignified ring to the acronym couldn’t have been more at variance with the consequence of its namesake: President of the United States. On a superintendent’s lips or on a brass-pounder’s key, a single mention of POTUS could bring a railroad’s entire system to a halt, diverting every eye, ear, and hand to the safe conduction of the president over the high iron. Roosevelt’s staffers climbed out of the motorcade and made their way to the ten-car train, toting along all the materials required to conduct the presidency some 720 miles away from Pennsylvania Avenue. Grace Tully, Roosevelt’s trusted secretary, recalled taking a “tremendous stack of letters and bills” in addition to “the usual leisure-time paraphernalia, [FDR’s] stamp collection, catalogue and equipment.”16 Someone hoisted aboard a huge wooden box stuffed with books, which the president intended to sort and autograph. Although Tully would not think much of it at the time, she recalled later that Roosevelt twice referred to the wooden box of books as a “coffin.”17 Tully’s typist, Dorothy Brady, accompanied her. Presidential assistant and trusted letter writer William Hassett, functioning as press secretary in place of Steve Early, who would be staying behind, walked toward the train along with his secretary, Alice Winegar. Louise Hackmeister—“Hacky,” as everyone knew her—went along to handle the telephone switchboard once the train reached Georgia. Dewey Long grabbed the handrails and trotted up into one of the Pullmans, as did Lieutenant Commander George Fox, who sometimes gave rubdowns to the president. Leighton McCarthy, the Canadian ambassador who had somehow also found the time to be a trustee of Warm Springs, was along for the trip, too, as was Toinette “Toi” Bachelder, who had once been a patient of the Springs until FDR hired her as an assistant on his White House staff. Three seasoned reporters (dubbed the “Three Musketeers”) would be riding with POTUS, as they usually did: Harold Oliver of the Associated Press, Robert Nixon from the International News Service, and Merriman Smith from the United Press. For the newsmen, duty on the chief’s train wasn’t just a plum assignment, it was mostly downtime; little important news broke while the president was at Warm Springs. “It was a smaller party than usual,” as Tully recalled, but it was still a considerable group.19 Representatives from the Southern Railway and from the Pullman Company—along to attend to such details as FDR’s preference for pheasant and terrapin on the menu and his insistence that the train’s speed stay below 30 miles per hour, allowing him to wheel himself around without having to anchor his wheelchair20—dropped their suitcases in the carpeted aisles of the sleeper Imperator. The Secret Service detail made its way down to its own Pullman, the sleeper/lounge Conneaut. The Conneaut was always coupled one up from the Ferdinand Magellan with its lounge section facing aft so the agents could keep an eye on FDR’s car, a task aided considerably by the lounge car’s large observation windows. A thin, distinguished-looking black man named Fred Fair did the serving, and just about everything else aboard the Magellan. Attired in his white Pullman jacket, Fair was the one man who never left the president’s car, even when it idled between trips in the forgotten corners of railroad yards for weeks at a time. Born in 1898, Fair knew the Magellan and its countless quirky features: the cigar holders in the bathrooms, the fact that the car’s rear door opened only from the inside. Fair had once saved a Secret Service agent trapped out on the vestibule from asphyxiating just as POTUS entered a smoke-filled tunnel.22 A repository of countless overheard secrets, Fred Fair still remembered how embarrassed FDR had been the day the two had first met, years before, when “the Boss”—as most everyone called FDR, including those who did not work for him—had fished in this pockets for change but found them empty. “I want to tip these people,” FDR had whispered to an aide.23 The leader of the free world who was concerned about tipping a Pullman porter—that was the president that Fred Fair knew. It was a strange request. Tully had pinned her hopes on this trip rejuvenating the president as Warm Springs had done so many times in the past. The retreat was an opportunity for less work, not more of it. But Anna, like everyone else who’d grown worried about the president’s increasingly haggard appearance, had been groping for a solution, the magic blend of the rest FDR needed and the complexities of his office that he’d once thrived on, to somehow rekindle her father’s effervescence and kinetic charm. Anna had watched her father’s inexorable decline, perceived Bruenn’s helplessness to halt it, and was desperate. Everything on the Ferdinand Magellan weighed too much, but that had been the idea. Three years earlier, during the dark, first days of the war, Steve Early and Mike Reilly had decided that it would not do to have the president of the United States traveling around in an ordinary Pullman. At the time, seven Pullmans, all built in 1929 as part of the same lot, had formed the presidential railroad fleet. Early and Reilly chose the Ferdinand Magellan to be sent to Pullman’s Calumet shops outside Chicago for a special overhaul. Workers stripped the Magellan down to its ribs, reinforced its frame, and added armor plating and three-inch-thick bulletproof glass. It was said that the Magellan was strong enough to withstand a fall of over a hundred feet from a railroad trestle without telescoping.28 If anyone aboard happened to survive such a plummet, roof hatchways offered an escape (though not, ironically, for a paralyzed president). The Ferdinand Magellan tipped the scales at over 142 tons; other Pullman cars of its vintage weighed only 80. It was a boulder, or more like an entire mountain; it was a literal rolling fortress with a president inside. One locomotive engineer said that the Magellan “drag[ged] like a brick bat on the tail of a kite.”29 Because of the car’s weight, trainmen usually were forced to add an extra locomotive up front to make sure that POTUS could make it over the steep grades. While the Magellan’s interior was spare compared to the lavish Victorian clutter that ran riot within the White House, the Pullman was plenty fancy. Entering through the vestibule’s heavy door, the visitor stepped into an observation lounge packed with stuffed, velvety armchairs in shades of rust, green, and blue. Draperies hung from each of the room’s eight windows. Gleaming deco ashtrays sprouted like chrome fountains from the carpeted floor. As the populist president knew well, his Pullman was far nicer than the spaces most Americans called home, and he treasured the car accordingly, never seeming to lose the boyish thrill he felt each time he rode in it. The Magellan belonged, technically, to the Association of American Railroads, but it was never presumed to be anything other than the Boss’s car. It was time to go. The porters dropped and locked the vestibule hatchways as the first, tentative tugs of the engines coaxed a rusty protest from the train’s wheel trucks. The brakes relinquished their grip and POTUS snaked out onto the Maryland Avenue main line, following the bend to the southwest that took the train onto the Potomac River bridge. As the engines turned their noses toward the setting sun, gold light danced along the string of windows and across the wide planks of riveted steel that wore a dignified coat of Pullman green. Inside, communications men donned headphones, journalists unpacked typewriters, dining-car cooks prepared to start serving dinner, and a lone black Scottie whose silver collar tag read “I belong to the President”35 made himself comfortable in the Magellan’s lounge. 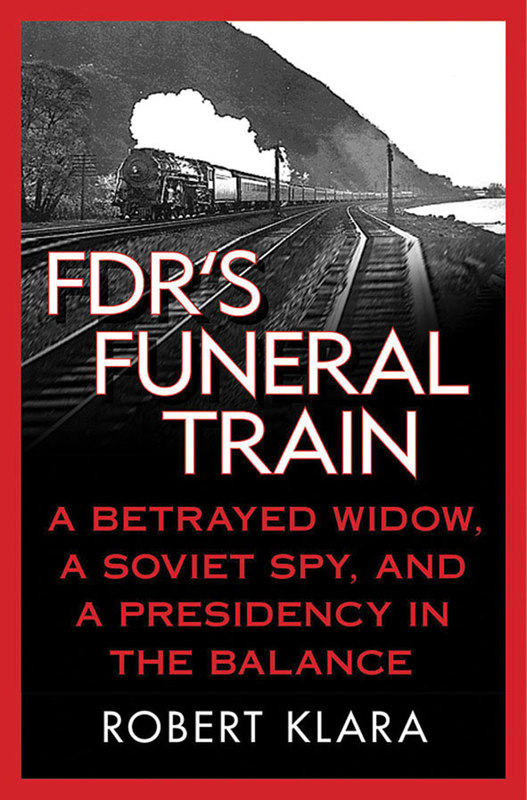 Excerpted from FDR’s Funeral Train: A Betrayed Widow, a Soviet Spy, and a Presidency in the Balance by Robert Klara. Copyright © 2010 by the author and reprinted by permission of Palgrave Macmillan in the US, a division of St. Martin’s Press, LLC. ROBERT KLARA is the author of the critically acclaimed book FDR’s Funeral Train. Salon called him “one of the most engaging writers you’ll ever read.” His work has appeared in the New York Times, the New York Daily News, American Heritage, and The Christian Science Monitor. His latest book is The Hidden White House.